I have often told my students at Utica College that karma isn’t about an eye for an eye or a tooth for a tooth. If that was true, we’d all be blind and eating our meals through a straw. 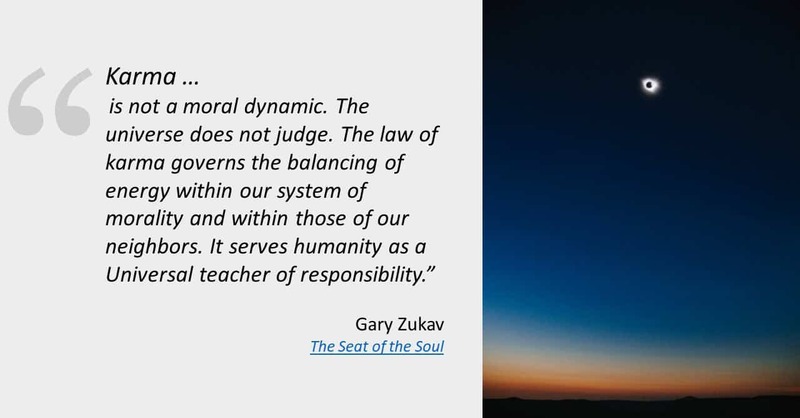 For someone like me, who tends to value sacred law as much, or sometimes more so, then human law, Gary Zukov’s definition makes perfect sense in my current world. I didn’t always view events in my world from a sacred perspective. I graduated from Utica College in 1977 with a Bachelor’s Degree in Psychology and believed for many years that behavior could only be explained through rational and quantifiable means. My beliefs remained largely unaltered even after completing the requirements for my Masters in Social Work Degree from the State University of New York in Albany in 2002. As often happens in life, paradigm shifts occur due to challenges presented as a result of catastrophic events. On March 1, 2003, my 18-year-old daughter Jeannine died due to a rare and incurable form of cancer. In the space of approximately ten short months after diagnosis, my vibrant, passionate daughter was no longer part of my physical world. All of my education and training seemed irrelevant to the path which I was now faced with navigating. It was a path wrought with uncertainty, and fear that I would never be able to break through to the other side of unspeakable loss. I also knew that, regardless of the outcome, I would be forever changed; the person that I once was, a distant memory. As I evolved in grief, I began to slowly consider non-human law perspectives. In particular, after-death communication, past life experiences and the importance of ancestral healing resonated with me. These perspectives allowed me to be open to the teachings of karma, particularly as it relates to Gary Zukov’s definition. Not only did my self-awareness increase but my relationships with my daughter and past ancestors had new meaning. The continued bond that I now share with my daughter almost sixteen years later, has convinced me that relationships are eternal. I want to conclude with a description of two events where karma contributed to my ongoing spiritual awareness. 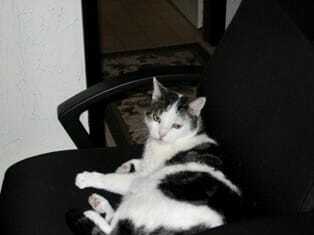 The first involved my cat Bootsy, who was my daughter Jeannine’s cat before he became mine. The second involved a past life experience that made itself known to me. Bootsy died on March 22, 2016, after twenty-plus years of providing much joy and comfort to our family. During the later stages of his life, when he became more physically frail, he chose me to be his caretaker. It was my job to make sure that he ate and had access to my lap to curl up in whenever he so desired. Bootsy helped me challenge my self-perception that I was an inadequate caregiver for my daughter Jeannine during her illness. My self-perception was based on my lack of proficiency in doing the day-to-day physical tasks to make Jeannine more comfortable. Bootsy taught me that there are many levels to caregiving, such as compassionate presence and benevolence. He helped me realize that this was what I provided to my daughter during her challenges with cancer. Because of circumstances in our life, we became responsible to and for each other’s well-being. This was our karmic contract. Because of Bootsy’s teachings, I was able to embrace a peaceful perspective about my caretaker role during Jeannine’s illness. The second event occurred in the early part of 2012 (my journal entry helped preserve this memory). I had a session with my shamanistic holistic practitioner and she was nudged to have me lie down on her table. Afterward, she revealed to me that she had a vision of a four-year-old child riding with his father in a chariot. The chariot tipped over, crushing the four-year-old boy. In a previous session, I had expressed anger and resentment over my deceased mother’s overprotectiveness with me after my father left us when I was five years old. Following a period of reflection, I determined that the four-year-old boy who died in that vision was me in another lifetime. I believed that the father who was driving the chariot became my father in this lifetime. I felt that my mother in this lifetime was also with us then as well. I reflected on the anguish that my mother must have felt because of her inability to protect me. It was identical to the anguish that I experienced following the death of my own daughter. I also believed that due to my mother’s inability to protect me in a previous lifetime, that our soul contract during this lifetime was for her to protect me, even at the risk of angering or perhaps even alienating me. Her soul needed to help my soul further understand the raw pain of my own experience as a parent whose child died. This was our karmic responsibility to each other. That understanding helped me find peace with my mother’s actions approximately eighteen years after her physical death, and in the process, solidify her position as one of my wise and most influential spiritual guides today. Though karma has helped me embrace a sacred and peaceful perspective after the death of my daughter, I still occasionally yearn for Jeannine’s physical presence. I don’t try to suppress or distract myself from those yearnings as I did in early grief. Those yearnings are and will be a part of my human experience for the rest of my time on earth. David J. Roberts, LMSW, became a parent who experienced the death of a child when his daughter Jeannine died of cancer on 3/1/03 at the age of 18. He is a retired addiction professional and an adjunct professor in the psychology department at Utica College. Dave is a featured speaker, workshop presenter and coach for Aspire Place, LLC (www.aspireplace.com). He is the chapter leader for The Compassionate Friends of the Mohawk Valley. Mr. Roberts has been a past HuffPost contributor and has contributed other articles to Medium, Open to Hope Foundation, The Grief Toolbox, and the Recovering the Self Journal.